The pertinent item from Geneva concerns the WMO statement on the Climate of 1999. WMO has been issuing these for the past 6 years. There are 10,000 printed each time. There were two possibilities for the front cover (1998’s showed the instrumental record from 1856) – the millennial long temperature series or the contrasting storm tracks for 1998 and 1999. I was the only one voting for the latter – partly personal as I knew I would have to organise the former. I was outvoted 12-1, maybe because in a brief presentation I oversold the advances made in paleoclimate studies over the last few years ! WMO want to go with the millennial record on the cover and I said I would produce something and some text. The figure will be the 3 curves ( Mike’s, mine amd Keith/Tim’s). Tim is producing this curve (all wrt 61-90 and 50 year smoothed). Each will be extended to 1999 by instrumental data for the zones/seasons they represent. Along is also attached the draft of the brief text to appear on p.4 of the report for the comments. Jones further brags about the importance of the WMO publication. The full text of the report is then printed during Feb 2000 – last year’s was 12 pages long. It will be released on March 15 in Geneva to coincide with WM (World Met) day and the 50th anniversary celebrations of WMO as well. WMO are planning to print at least twice as many copies as usual and were talking about 25,000 ! Copies go to all WMO members and are distributed at countless meetings and sent to loads of address lists available. Note that Jones clearly explained what he means by “Mike’s Nature trick”. Mann has claimed that his “Nature trick” was nothing more than clearly showing observations and reconstructions on the same graphic with proper labeling. But the direct comparison of observations to reconstructions is as old as statistics – and Jones and Briffa had themselves made such comparisons in prior articles without regarding clear labeling as anything more than elementary hygiene. In this email (which is often shortened in quotation), Jones says that Mann’s “Nature trick” is “adding in the real temps to each series for the last 20 years (ie from 1981 onwards) amd from 1961 for Keith’s”, as originally explained in November 2009 here. The text looks good, and I agree w/ everything that is said. I think its a strong but defensible statement, and will help to bolster the claims to be made in IPCC. The ’99 numbers are very interesting, and should help thwart the dubious claims sometimes made that El Nino is the sole culprit in the anomalous recent warmth. There is no objection to the graph, which, according to Mann’s book of Fairy Tales, is undisputably misleading (crediting the whole figure to Jones). and Jones’s 1999 World Meteorological Organization (WMO) report cover graph depicting past temperature trends was criticized as potentially “misleading” for merging proxy and instrumental data into a single curve — a conclusion nobody really disputed. Mann further tries to help by sending “for comparison” the draft version of the IPCC AR3 Figure 2-21, and explains a nice “trick” how to handle the baseline in the face of the decline. Just for comparison to what Tim is producing, I’m attaching the plot you may remember that we (actually, the UK Met Office staff) prepared for the final version of the IPCC chapter 2 draft (in pdf format). To refresh your memory, we used the ’61-90 base period for the absolute anomaly scale, but we aligned the series based on an earlier (’31-60) interval of the instrumental record, which pre-dates (largely) the recent decline in the Briffa et al series. I think this leads to a similar picture, but if you think there are any significant discrepancies w/ what Tim is preparing, we should discuss. Ten minutes later Osborn sends the draft figure to Jones, who forwards it to the crew half an hour later with the baselining explained. Keith and Tim’s diagram is the new one that didn’t make it to the present IPCC draft. For the other two, yours has 0.12 added to it to correct your base period of 1902-80 (can’t remember your exact dates) to 1961-90. For mine we’ve used a mean and SD calculated by Tim based on April-September average temps from the NH Land series north of 20N. There is no protest from the MBH crew after after seeing the figure, and only Malcolm Hughes comments an hour later. Dear Phil – the text looks fine to me. I have no strong preference regarding the diagrams, except that hte one Mike circulated hs the advantage of sowing an estimate of uncertainties. So far only Keith Briffa appears to have not made comments about the publication. However, we see his acceptance from the letter written next morning to an Elsevier editor inquiring if the new version for Briffa’s QSR (2000) Figure 5 had been substituted. with regard to the earlier message ( copied below) could you confirm the the new Figure was substituted as I now wish to cite this in a forthcoming WMO publication that will be widely distributed. QSR (2000) is the reference for Briffa’s series given in the WMO publication, and later in the IPCC AR3. The email is important on its own as it explains the troubles I (and George Kukla, see below) had 15 years later. However, as can seen from the above, there was no consideration of the special audience when the graph was produced. Instead, Mann argued that it will “help to bolster the claims” to be made to the IPCC audience. Further, it appears from the CG letters that the “overly simplified and artistic depiction” was further distributed among their colleagues for the scientific purposes. In February 2000, Bradley requests the figure for the possible use in the PAGES systhesis report. The attached file has the data you want. There are 5 columns (mine, Mike Mann’s, Keith’s, Annual NH and JJA NH). The last two are instrumental and only start in the 1850s. Keith’s starts about 1400. All are wrt 1961-90. You will see that for the 3 multiproxy series this file has been extended to 1999 by adding in instrumental data for the season and region each was supposed to represent. The other attachment is a figure of the first 3 which has appeared on the front cover of the WMO statement for 1999.
and later in October 2000 to Jim Hurrell. Tim can send you one with all the series in. wmocover.ps is what appeared on the front cover of the 1999 annual statement. On this the series have been extended with equivalent instrumental data to 1999. In fact, it seems that they were so proud of the figure that they placed the graph on the back of the official CRU t-shirt, which Mann was more than happy to request. You are the only guy who may know what was and is going on in the northern forests. With respect to that I do not think that the WMO statement # 913 on the status of the global climate in 1999 is a sufficiently reliable last word. For one thing: the curve attributed to you doesn’t seem to jive with any of the figures of your 2000 QSR paper. Where from did they get the 0.6 degree departure at 1600 AD? 1) The calibrations of the rings to temperature prior to 1950 are biased, possibly due to the poor coverage of temperature stations. 2) Something other than the temperature influenced the trees in the last several decades and we do not know what. In either case it is not very responsible to relate the curves to global climate as WMO has done. You are saying it, albeit somehow indirectly but pretty clearly, in all your papers. Unfortunately it appears that these are tooo long for WMO to read. I think it’s fair to say that George Kukla was first to spot the Hide-the-Decline. This entry was written by Jean S, posted on Sep 22, 2014 at 7:18 AM, filed under Uncategorized and tagged decline, jean s, jean_s, trick, wmo. Bookmark the permalink. Follow any comments here with the RSS feed for this post. Both comments and trackbacks are currently closed. maybe you could add a graphic, that shows thermometer removed and hidden decline included? ie it becomes really really obvious to any casual observer, when the graphics are side by side. Ditto on your comment. The two graghs compared side by side make a stark impression and that is all that is needed. The catalyst which ignited ‘general public’ skepticism worldwide. Surprisingly, http://www.HideTheDecline.com is still available for purchase. What a great domain around which to aggregate and summarize the articles and graphics for this case of (what appears to me to be) scientific malfeasance. Really nice article. This summary of the events is excellent. Great work, even though I knew what was done your time line really lays it out. Any one that was involved with this travesty should have there degrees revoked; what ever there are that are not scientists! Unprincipled non-scientists who got away with far too much for far too long. Having more than enjoyed their day in the sun , lets hope that sooner rather than latter their feet are held to the fire. Yes, this figure was competing with another nonpaleo one. I think without Mike’s Nature Trick, they lose the cover entirely. What to do ? Back down in front of his peers on his oversell (oh, the shame), or cheat ? I made a few small edits, including the addition of Jones’ statement that he had “oversold” the paleoclimate advances to WMO. If people are interested, we can also make a pdf of the emails in chronological sequence, extracting from threads. I’ve spent an inordinate amount of time doing this, as has Jean S. Jean S’ quotes are NOT taken out of context. I also added a paragraph commenting on “Mike’s Nature trick” – linking to Jean S original post on the topic on November 20, 2009. Mann’s pleadings (unsurprisingly) misrepresent “Mike’s Nature trick”, claiming that it was nothing more than comparing observations and reconstruction on the same graphic with clear labeling – though such comparisons are as old as statistics and hardly original to Mann. All the years of accumulating data from these events has left me fuzzy, but wasn’t it Mann who first denied that no one was aware of anyone “ever” splicing observed temps on to proxies, almost indignantly? When was that vis a vis the events depicted in this fine post? And wouldn’t it expressly contradict what is detailed here? Actually, that quote would fit nicely in the article above. Were the observed temps subjected to some statistical function after splicing, creating a new, incorporated “whole” that the Racehorse crowd would argue makes Mann’s statement somehow technically accurate? I/O/W, was it “smoothed’ or “filtered” (I am a layman and those terms make me thirsty) to create a new “curve” which is not simply the proxy + obs temps? Note the comment he makes about “most” studies validating a reconstruction during recent times. I’m trying to recall just how many proxy reconstructions don’t validate themselves during recent times. If there are as few as I think there are, this “most” comment could be a recognition of the Shweingruber series in particular during the same sentence where he denies doing what he actually did. I thought he posted a followup to this comment acknowledging that MBH padded with the mean taken from the instrumental record. Excellent collation, Jean. When Mann admits something is wrong, even as he denies culpability, it’s an indication that something is very wrong. You’ve exposed here all the symptoms of climate-change fever: data manipulation, confirmation bias, and blatant dishonesty. Googling ‘climategate emails out of context’ yields 37,800 hits. Names high on the list include Mann, Gore, Trenberth, Greenpeace, desmogblog, etc. Jean S’ diligent work is appreciated – Steyn must be just dying to hug him! How ironic: Jean S pulls together a narrative in which the Team, in their own voice(s), reveals the very facts, motivations and manipulations that the Skeptics (Steve, Ross, Jean, Jeff, Andrew, et al) have been teasing out for years. It is a very clear narrative; I have a hard time conceiving of an alternative point of view that is credible and charitable. Meanwhile, the indoctrinated march on, like moths attracted to a flame, regardless of the fact that scepticism is a basic principle of the scientific method. Jean S: I did not notice you responding anything in this article or I do not understand your ad-hom attack on Steve as you clearly recognize that this post was not written by him. In fact, I’m not even sure if you actually read this post. I’m positive you did not understand it. Of course you write whatever you wish, but I’m sure even most of your readers are capable of recognizing where the substance is. Nowhere in the quoted emails is there any suggestion or approval or any indication by Michael Mann of seamlessly merging proxyindicator data and instrumental data. The email had just three recipients – Mike Mann, Ray Bradley and Malcolm Hughes, with cc Keith Briffa and Tim Osborn. Michael Mann was an active participant in the discussion, sending a reply just two hours later. Further, excluding salutations the words & number counter of the email is just 104. If this was a slur on Mann’s good name, why no response from him or his friends? The text looks good, and I agree w/everything that is said. ……. Mann not only assents to what is being put forward, he puts forward something that corroborates the final graph. This looks to me like eager approval of splicing the proxy and the instrumental record. Further, if he was not the real inventor of this “trick”, then he failed to deny it at the time. Yes, indeed, they spliced the proxy and instrumental data. That. Was. The. Point. Of. The. Graph. Jean S: We have a winner! We found a person, who is disputing the fact that merging proxy and instrumental data into a single curve is misleading. Not only that, according to you, it was the purpose of the graph! Or are you saying that it was purpose of the graph to mislead? I know, I now, this is hard. “No researchers in this field have ever, to our knowledge, “grafted the thermometer record onto” any reconstruction. Yes, and simply discounting the ‘decline’ did nothing to (falsely!) increase the credibility of the pre-instrument reconstruction, right? I am not certain if ‘dense’ or ‘obtuse’ is a more appropriate adjective. I think Greg Laden is providing a valuable service to Steyn’s lawyers with his obduracy and logical contortions. Steyn’s lawyers can essentially assume there will be other more informed diehards who Mann may use as witnesses to support his arguments. It is best the lawyers anticipate that they will have to deal with folks whose commitment to a cause makes them blind to the reality of what Mann has actually done or caused to be done or has helped facilitate. They will need a raft off “yes” and “no” questions that limit the chances of wriggling of their self-made hooks. It will likely get frustrating as Ladenesque logic is applied to the obvious to make it appear that black is white and vice versa. All right, I give up. There is just no way to make sense of Laden’s comments. “The Point of the Graph” – just unmentioned? The word “seamlessly”? Whatever; it’s a waste of effort. “Yes, indeed, they spliced the proxy and instrumental data. That. Was. The. Point. Of. The. Graph. “…they spliced the proxy and instrumental data”, as you say. They did not note or define any seams in the splice. E.g. they seamlessly spliced (aka merged) the proxyindicator data and the instrumental data. No, that is not hard to understand. So according to Greg Laden, Michael Mann is incapable of understanding The. Point. Of. The. Graph. But JeanS (who brought up this same thing like 3 years ago) doesn’t look like he was directly responded to, despite being the first post. Briffa et al 1998a (Nature 391): During the second half of the twentieth century, the decadal-scale trends in wood density and summer temperatures have increasingly diverged as wood density has progressively fallen. The cause of this increasing insensitivity of wood density to temperature changes is not known, but if it is not taken into account in dendroclimatic reconstructions, past temperatures could be overestimated. One of the issues skeptics face in countering claims by the actual scientists that obtained and/or first analyzed the data, is that the way that these scientists enter the data into the record through peer-review ends up becoming more-or-less the standard for how it should be viewed and used. So, if Briffa declares his data is ‘less sensitive to temperature’ ONLY after 1960 or whatever and this should be discarded, then what can you say? What malfeasance can you impute to scientists that use the Briffa data and simply point to his own peer-reviewed sentiments on it as a deference without even getting into it on your own. It’s the same reason for the consternation of skeptics regarding all sorts of ice-core data that would appear to show a different temperature chronology– yet the ones who obtain/published it first declared at the outset that using it for temperature isn’t advisable (post-hoc or otherwise). You can bet that Revkin is reading this. As it might be thought of as being representative of a specific body of paleoclimate science research, is there some specific version of the Hockey Stick — or possibly some specific combination of Hockey Stick versions which appear on a single graphical illustration such as TAR Figure 2-21 — which represents the most commonly accepted “state of the art” version which is now in use today? For example, if one were to examine a collection of climate science textbooks used in preparing college students for careers in the climate science research community, how would the Hockey Stick most often be depicted in those textbooks? As an illustration similar to TAR Figure 2-21, or would it be some other kind of illustration? Nowhere in the quoted emails is there any suggestion or approval or any indication by Michael Mann of seamlessly merging proxyindicator data and instrumental data. The original documents clearly show that this is not what happened at any stage. http://www.meteo.psu.edu/holocene/public_html/shared/research/MANNETAL98/fig7-nh.dat or try to replicate the MBH9x smooths (instructions and tools here). Jean S, your efforts in these technical reviews are much appreciated. I think that sometimes those who want to defend the indefensible will never look at all the evidence together but just isolated pieces of it in (unsuccessful) attempts to maintain some kind of plausible deniability. An observation that is difficult to avoid in these matters is that in many, if not most, of these reconstructions, the need to clearly keep the observed and reconstructed evidence separate (and that goes beyond the issue of divergence) has not been observed. Any truly scientific discussion would point to these differences first and foremost as critical to the validity of using proxies as thermometers. What has transpired in this arena is more in line with advocacy getting the upper hand. Please tell me that Greg Laden is not (remotely) a scientist and I will feel a bit better. At some point, near the top of the core, the tree pollen may be suddenly and dramatically reduced and the wind blown grass pollen may switch to mostly corn or wheat. This is farmers coming in and completely changing the environment. The core from that point on up may become useless. A good example that Greg laden could have used for this is the Tijlander varve sediments which specialists interpret as being contaminated in later centuries by farming and yet were used as proxies. Yes, see Comment #14 (AMac) at the referenced post, and the responses at #18 (Greg Laden) and #22 (Dan Hughes). It’s very difficult to converse with somebody who uses his moderation powers to disappear polite, on-topic posts. In the thread of Greg Laden’s post, one Rob Honeycutt posed a question to me (#74). I responded (#76), prompting silly comments by Rob (#77, #78) and Greg Laden (#79). Thank you both for your prompt responses. I’ve reviewed the issues concerning the Tiljander data series — really, they aren’t temperature proxies, as far as anybody has shown. Neither of you seems very well-informed on this subject, and its implications for the robustness of Mann08’s findings. That’s ok — it’s a wide world, full of interesting topics; nobody can master them all. However, these aren’t the preconditions for a mutually-beneficial conversation. FWIW, I present my perspective in this Yahoo answer (#5) and the links therein. Until such people are willing to hold themselves to a higher standard of conduct, there seems little point to engaging them. Overnight, Greg Laden decided to allow my comment (copied above) through moderation. Better late than never, but this debating technique is a home-field advantage that is invisible to readers, and to the record. Steve: it was pioneered at real climate. It was offered to CRU in an email. They would tie up comments sometimes for several days, by which it was lost, except that they could after the fact point to it. Sadly, I’m thinking there’s only 0.1% of climatologists that are giving the rest of them a bad name. Sadder still, it’s too bad the ‘rest of them’ aren’t willing to defend themselves – or better – part from those giving them a bad name. This thread must be hitting home somewhere . . . or maybe I’m just hoping anywhere . . .
I’m sorry to tell you this, but you are going to feel very bad. The scientific method is a pre-modern idea. The modern method is: How do you feel about it? I’m sorry about it, I think that you are correct. And he still has nothing to say about the fact that Mann made a number of claims in his submission to the court which are dead wrong.Wilfully blind is perhaps the best description of his views. It’s funny. PaulD is killing them, and they pretend he isn’t there. Laden needs to stop the bleeding. Ban PaulD! for the good of the cause. Probably just a remarkable coincidence, but isn’t interesting that the first Climategate release came on virtually the same date a decade later?? Was the mystery Climategater thinking of this date?? Naaw, but fun to think about, I’d say. Jean S, as always your incisive work is enormously appreciated by many! This is truly a masterful review of these issues. As for the 10th Anniversary (Nov. 2009) of these infamous proceedings, it makes an amazingly fitting coda to the Jones-Mann-Osborn-Briffa machinations that the public release of Climategate files began exactly a decade later. Pure coincidence, we must assume, but still remarkably appropriate. I tried to read Greg Laden’s post, but found it completely mystifying. Did it have anything at all to do with the post it purports to critique? Aside from that one line, where he says It Never Happened! – without bothering to justify that claim in any way. I’m at a loss to understand who his post is written for. Obviously not for anyone who read this one. There should be some rule against wasting electrons like this. It honestly read like one of those spam blogs that string together a series of related words in order to attract hits and drive up page ranks. I know that it wasn’t that, but, it had the same feel. Okay! I think I’ve got this scoped out. 2) Therefore, when they see the post here, which is all about “hiding the decline”, they cannot pay any attention to the details of the hiding, since that is no problem. 3) Therefore, they put up a post which in their minds takes care of this issue at its root, claiming that the decline is no problem and proxies are awesome. 4) Therefore, the rest of us, who understand clearly the problem with “hiding the decline”, think they are crazy or unable to read. A fair analysis and quite plausible. Leaves open the possibility that Mann has sold them these ideas. IMO Mann is on the scout for true believers who will be of some use. mpainter: I try to follow Steyn on this issue. Where is he saying that Mann wants to wriggle out of this? Incidentally Greg Laden’s post to which we were referred contains an interesting admission. I interpret that as saying that if the proxy, or any part of it, does not help the preconceived hypothesis it may be discarded as “noise”. That appears to have been done and not just to “hide the decline” but on other occasions where samples do not provide helpful data. Only tea leaf readers and occultists of the CliSci world are capable of distinguishing “good” proxy records from “noise” ….. outsiders are incapable of performing such feats of intellectual alchemy. You have hit the nail right on the head. Greg Laden has described and personified selection bias. he could be ‘Clever Hans’, in equine. Your interpretation is correct, for there are a number of quotes from proxy reconstructionists that say essentially the same thing: in effect, you must have the expertise to be able to sort out the “true” signal. This approach, of course, allows any sort of proxy to yield the correct results. Put another way, it may have been warmer (insert large number her) years ago than it is today and we wouldn’t know it from the tree ring records. Interestingly, Greg Laden (referenced above) writes, “At around 1960 the ability of the tree ring data to represent regional temperature declines and the tree rings become useless. Prior to that time the data should be used. After that time the data should be discarded.” I wonder what data or theory supports this view. Very telling is Phil Jones admission that he “oversold” climate reconstruction and so consequently voted against using the graph yet being outvoted 12-1. This is a most pregnant statement. Of the correspondents in this business only Kukla addressed propriety of what was done. the timing of Jones’ admission of overselling is interesting. There are some other Climategate exchanges in which the paleos feel slighted at their work being insufficiently valued by modelers, with some barbs aimed at weaknesses in the models. Readers will recall the remarkable exchange among IPCC authors in September 1999 following the Arusha meeting in which there was concern that the Briffa reconstruction “diluted the message” and Mann said that he did not want to give “fodder to skeptics”. A month later (October 27, 1999), the First Order Draft of the AR3 report was issued with the decline deleted from the Briffa reconstruction in the spaghetti graph. This was only 3 weeks before the WMO exchange. 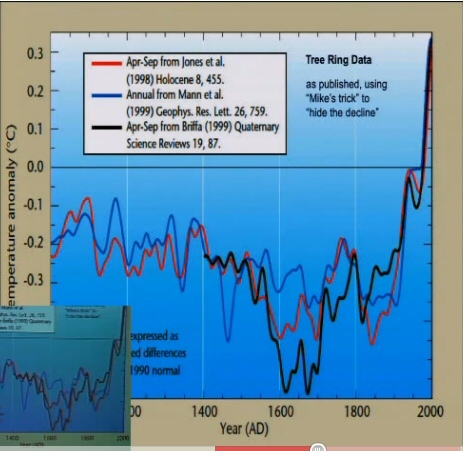 Mann referred to the graphic in the draft IPCC report in his correspondence with Jones. You can then decide for yourself how you wish to address his comments: As his “review” came in without our asking for it, we will certainly not make addressing his concerns a condition for publication. Finally, when the episode is over, we have the famous vomit-letter from Bradley to Briffa. Ah, so the paleos felt the sting of being insufficiently appreciated. Now this is interesting because personal motivation is something quite apart from mere zealotry. I recall Phil Jones nervous fits that occurred in the early stages of the climate gate episode. Jones surely remembered his part as given here. Those plaintive emails conceivably might fit in with this excellent collation of Jean S.
That is the first time I’ve read the vomit letter. Hilarious, and a wonderful example of oleaginous, self regarding Mann-Logic. Interesting. I had always assumed that the “fodder for skeptics” comment was referring to those in the public generally skeptical of CAGW. Now as I consider the quote in context, Mann may very well have been referring to those within the scientific community that were underwhelmed by the claims coming from the paleotemp recon/ proxy researchers. I may be mistaken but I don’t believe that there was much public skepticism surrounding AGW, in general, back in 1999. Therefore Mann would not be as concerned with outside scrutiny as he would be with that which came from within. Interesting that Mann claims credit for the final wording in the vomit letter, but given the many inaccuracies Steve, Jean S and others have pointed out here, he may have to blame someone else for the content of his pleadings – his few defenders here have already argued that his lawyers are at fault. The choice of wording in the final version was much better too. Wording matters! . . . . I like to think that may feedback helped here–so I take some pride here as well. These are court pleadings, written and signed by the lawyers. They are not written by Mann. This sounds to me like the output of some lawyer who has seen the HS graph and is trying to describe it to the court. Jean S. composed a symphony that would have done his namesake proud! Jean, really nice job with this summary. And if you are out there reading, a huge thanks to CG “FOIA”. I really wish I could buy you a drink. wow that Twitter commentary is truly pitiful — peevish, angry, resentful, inept. Someone in CliSci world is really anxious about this sordid history…. the tweeter could be anybody. it could be the anti-loge of me. pitiful, yes. significant, no. i doubt that mann and lewandowski *need* sick-o-phants. they can do it all by them selves. I have a lot of pull! Just kidding. It really is a nice summary which is completely impossible for them to reasonably refute. So it appears that like everything else that goes wrong for the team, they will unreasonably refute it. Seems the current line is to focus on the words “text” and “said” and indicate all the agreement concerned those spheres, but (as the argument might go) implied no agreement to anything that was visual. Perhaps someone who also helped get that graphic to press that wasn’t Michael Mann would step in here and discuss whether or not they felt agreement (as opposed to disagreement) was there..? It would be bizarre (to me) for Mann to remain silent through even Prof. Jones’ stated misgivings, just to agree only to legend text or whatnot, if in-the-end he also disagreed with the WMO graphic (that he put on his CV as having a significant role in getting to press). Presumably he was one of the 12 in the 12-1 WMO vote? Jean S: Mann did not vote; he was in Venice. Mann wrote that his version looks similar. Alas it goes downhill from there and his supposed counter arguments to the first objection amount to “we can pick and chose whatever proxies we like to cover whatever periods we like and we do not have to be consistent in our decision rules for including or excluding a proxy.” He has no counters to the second argument except that Mann did not explicitly say “take the instrumental record and splice it onto the proxy series and do not tell anyone about it.” Given the work that Jean has done, I am pretty sure a Judge and jury will see the email string as doing expressly that. All this said, I have to say I find Laden’s way of arguing in general and in this particular case, barely logical to the point of being creepy. Also on this day, in 1938, LSD was first synthesized. Is there not a little “hide the decline” in the splicing of the instrumental record to the Mann et al. 1999 line in the WMO graph? Comparing the 2nd and 3rd figures, it appears instrumental data was appended to the Mann and Jones lines. The proxy data is not pared back as much as with Briffa, but there is some cutting or shaping. You will see that for the 3 multiproxy series this file has been extended to 1999 by adding in instrumental data for the season and region each was supposed to represent. The other attachment is a figure of the first 3 which has appeared on the front cover of the WMO statement for 1999. It seems to me instrumental data was attached to all three of the “WMO statement,” and cropping of proxy data was not limited to the Briffa product. Whoever made the WMO graph cropped, or flattened, some decline in the Mann line. A little follow up to my comment on the “2nd and 3rd figures,” i.e. those seen in the screen shots from Richard Muller’s video lecture (above at end of main body). Muller does note that all three lines have been appended. “They added the same temperature data to three different plots, giving the illusion that there are three different sets going up. And they smoothed it.” Obviously the treatment on the Briffa product is most dramatic. I question whether the Muller plot labeled “Mann et al 1999” actually represents data from Mann et al. 1998. The plots of Mann 1998 an 1999 are similar, except (noticeably to me at least) in the late 19th c. to 1980. The relevant Mann 1998 graph appears like the the Muller “Mann” version without added temps (Fig.. 2 above). 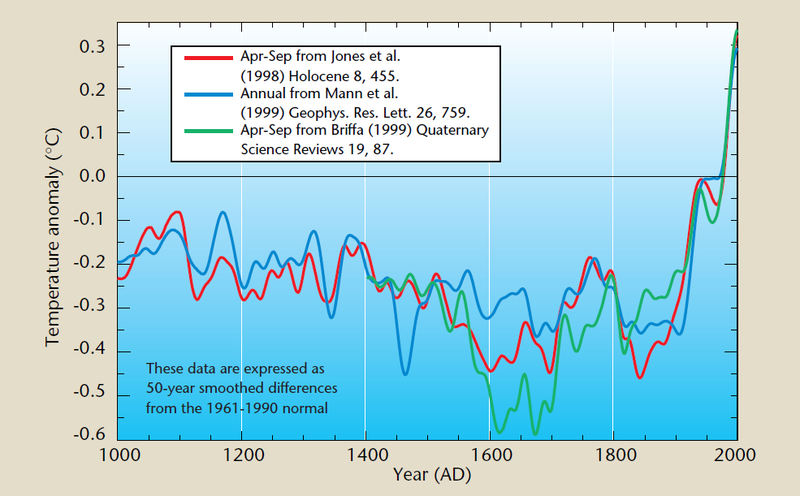 But Mann 1999 shows a 20th c. with a dip and rise–similar btw to Jones et al 1998. Mann 1999 also adds designated instrumental record that rhetorically trends with the rise without a lurch. Muller says, “If they hadn’t smoothed it, you might have gone ‘So wait a minute, what’s the change going on, right there? Why is it abruptly different? '” I would respond that had he used Mann 1999, an abrupt difference where pure instrumental is attached would be much less, or near nothing at all. So, perhaps, the reason for attaching “temperature data” to the Mann line in the WMO graph after 1980 is not so much with obscuring “an abrupt difference” apparent in Muller’ version, but something else. Why the WMO graph for Mann 1999 does not show the 20th century dip… I dunno. His 2oth c. Jones 1998 also differs some from other representations I have seen. Hide the decline, yup, that’s what they did. Jean S and Steve M – the world of science is indebted to you for your detailed and extraordinarily detailed forensic work in this murky matte. You both employ clear and uneqivocal English that even lay persons such as I can easily understand. Greg Laden broadcasts obfuscation and general silliness. Great work Jean S. It helps me to understand the various permutations of the tricks and graphs. I get the funny feeling that someone should be paying an orthopedic surgeon some cash for all of the graphing and splicing that’s going on up there. Did the patient survive? that El Nino is the sole culprit in the anomalous recent warmth. Brandon, notice that the account is new, and it was the first tweet. Additionally, the tweet was not addressed to anyone. Still, within minutes both Mann and Lew retweeted and started following. So whoever is behind the account had pretty good behind-the-scenes connection to Mann (and Lew). I agree, save I don’t know that they’d need a connection to both (as the two likely communicate about these sort of things). Even if there was a good connection to both, it might not be knowable from public information. I only point this out because I think I know who created the account. Sure, you only need the other one retweet and the other one sees it then. I was almost sure that you (or someone else who’s been closely following SkS) would have a guess of the author. There are only limited number of candidates, and typically graphs have their giveaways. AJ, I don’t think so. I don’t think someone like Greg Laden would make an account to post images he edited. It seems like too much work. So you’re clearing Michael Mann as the owner? Brilliant work Jean S – Loved it. JeanS: this passage reads awkwardly: ‘…the “simplified” figure was produced the “large nontechnical audience” in the mind.’. “Im interested in the use of proxy data – can you expand upon this statement? – Many thanks. I’m not sure what you are asking, but if you want to know more about the decline in the proxy curves, there is lots of good technical stuff on the web. Climate science moved on, with the dendros left to clean up the mess. It has been a couple years since I looked, but the decline appears to be related to age standardization curve artifacts, end effects, and other gremlins in the algorithm. The actual problems are O/T for a post about history because the scientists involved had not a clue as to what was causing the decline at the time the Climategate E-mails were written. Steve: attribution to standardization was a concept from CRU, but I haven’t seen this established beyond a hypothesis. Further, if correct, it would require re-calculation of all chronologies, not just the ones that decline. My own take on their main “argument” is that “not all” chronologies go down – so they pick the ones that go up. The Climate Audit critique of this practice is that ex post picking is biased and unscientific, but this criticism is shrugged off by the dendros. I think the idea that age standardization could be a factor was first described by Frank and Esper in their brief paper describing 7 or 8 potential causes of the divergence phenomenon. RCS standardization can indeed be a contributing factor as Matt states–my simulations as part of my PNAS submission definitely show this to so–although I much doubt that this is the only factor, given how strong divergence is at some sites. There’s some non-linear biological response(s) going on here, I’m pretty sure, i.e. the problem Loehle described in 2009.
curious: a number of us are aware of the big problems in dendroclimatology. It’s just that I’ve been the most vocal about it. Steve: Jim, in retrospect, I look at the failure of contemporary specialists to squarely confront the different results of the two 1998 large-population studies (Mann et al 1998; Briffa et al 1998) as a sort of original sin in these controversies. While someone sufficiently interested could locate the discrepancy within the literature, it was papered over in comparisons (spaghetti graphs) by hide-the-decline, thereby leaving the divergence problem under-exposed to specialists. And it is amazing that so many specialists (as frustrates you) think that saying that it is an answer to say that “not all” trees are divergent and that it is valid practice to ex post pick non-divergent sites. Multiproxy studies that used samples that were too small and too data-snooped to shed fresh light also contributed to papering over the problem. Esper et al 2012 ( an interesting study that I’ve regrettably not analysed in depth) raises important issues on long term variability in tree ring chronologies as well, as you are aware. Steve, I might take that one step further and consider the “original sin” the very idea that one could make reliable large scale reconstructions from tree ring widths *in the first place* (which probably dates to Harold Fritts, if not earlier). This field had very clearly not worked out basic biological and stat/math issues necessary to make reconstructions even at single sites, except in a few cases (mostly those with sub-fossil specimens having good overlap through time), let alone widespread collections thereof, almost none of which met that criterion. The idea that only the diverging sites (or trees) need to be discarded, either entirely or only for the years after which divergence is claimed to have begun, is just patently wrong, and shows a profound lack of grasp of the implications of Loehle’s argument. The thing I’ve slowly realized, is that those with the real biological and mathematical understanding of tree growth, needed to put the kaibosh on various claims made in various papers, just never did, for whatever reason. Furthermore, some of the dendro people just simply don’t even *understand* these issues; they’ve apparently never taken the time to learn some fundamentally critical biological concepts. They just get mired down in all kinds of data details, addressed by ad-hoc or poorly evaluated procedures, over and over. Whenever you have a field in which the analytical framework/fundamentals have not been properly worked out, this is what you get. A mess. The Esper etal 2012 paper is outstanding, one of the best ever published in the field, I’m convinced. That is exactly right, the dendros would have had the chops to challenge, but apparently they lacked the moxie. I have previously referred to this as “the silence of the dendros.” If we are in the mood to give them the benefit of the doubt, we should recognize that funding for dendro work has probably been at an all time high. But I also remember that Steve got disinvited to a dendro conference after being invited and preparing a talk, that is just pure cowardice. I’m sure that’s not correct though, so perhaps someone can explain what is meant by “moved on”. I think that you are touching ‘the boundaries’ with your ‘moved on’ question. Like ‘sustainability’ it means all things to all men. I really would love Briffa to retire and then be able answer some questions without ‘backlash’. Jim: As clear and as concise a statement as any here could want. I would not be surprised if you get a call from Steyn’s lawyers. “Zealots”, “incompetents” and “crooks” are not mutually exclusive categories. Like other commenters here, I thank Jean, Steve and others for their work that turned hypotheses about the antics of the global warmongers into stone cold facts. Fantastic post, Jean. many thanks for the time you spend revealing this much detail. A couple of things come to mind thinking about this post and seeing Mann tweet about it. First, the facts laid out in the post squarely place the issue of Mann’s potential actual fraud before the trial court, if the matter does come to trial. However, since the deception by Mann is so obvious, it gives Steyn’s actual malice defense (I hope he actually raises it)a big boost. It is very understandable from a number of perspectives to characterize Mann’s actions as fraudulent, no matter what the actual judgment on the precise issue of fraud would be. That being the case, it makes it much easier to demonstrate lack of malice. Second, Mann’s tweeting is supremely stupid in terms of its ramifications for his defamation case. Essentially, the way the law works is that your previous out of court statements which have a tendency to help you, are not admissible. However, to the extent that they hurt you, they are permissible on cross-examination. This is why most clients go incommunicado prior to trial. Mann’s lawyer has undoubtedly told Mann to keep quiet, but Mann is not smart enough to do so. I expect that Williams is pulling out his hair when he discovers that Mann is tweeting on matters relevant to his trial. It will be interesting to see whether there will be subtle signs of Williams’ potential exasperation with Mann in the future. What effect this post on Steyn’s countersuit do you see? If you would you care to comment on that. I don’t know DC law in particular, but according to the standards of most states Steyn doesn’t have a countersuit. Going by memory and not checking again, I believe his countersuit is in the nature of malicious prosecution. One typical statement of what constitutes malicious prosecution is this: “Malicious prosecution is a common law intentional tort, while like the tort of abuse of process, its elements include (1) intentionally (and maliciously) instituting and pursuing (or causing to be instituted or pursued) a legal action (civil or criminal) that is (2) brought without probable cause and (3) dismissed in favor of the victim of the malicious prosecution.” You can see there are a number of hurdles to overcome. In my view, Mann, being accused of fraud, and Steyn not having shown that Mann altered actual records (they were deceptively presented) it is hard to say that Mann has no right to seek a trial on the issue of defamation. I think Mann is trying to have the countersuit thrown out on SLAPP grounds. The countersuit is more an issue of putting focus on the tactics being used by Mann. I agree with JD’s assessment. I was,however, very impressed by Steyns lawyers reply to Mann’s motion to dismiss. Although I think it was and is a lost cause, Steyn lawyers arguments were creative, resourceful and aggressive. Interesting analysis! Brits have been eliminated by grammar usage and Americans by spelling. Leaves Canadians and Aussies. Oh – New Zealanders are still in the running also. Re: Political Junkie (Sep 23 15:41), it’s not unusual for reviewers to fake spellings/grammar from the other side of the pond to help mantain anonymity, so it’s unwise to read too much into details. I used to wilfully spell “colour” the wrong way in school in England. I think I only once got a teacher to bight. 1) to Jean S. for this admirable, clear and direct summary. 2) to Richard Muller for being perhaps the first to put the “Hide the Decline” vs. “Actual data” graphs side-by-side. As several have observed, makes the faking pretty obvious, doesn’t it. 4) and of course to Our Host, who’s been tirelessly pursuing this bit of research fraud for many years now. Steve, I know you don’t like the word, and I doubt that these clowns really *intended* fraud — but that’s what came out. And it’s *still* out there…. 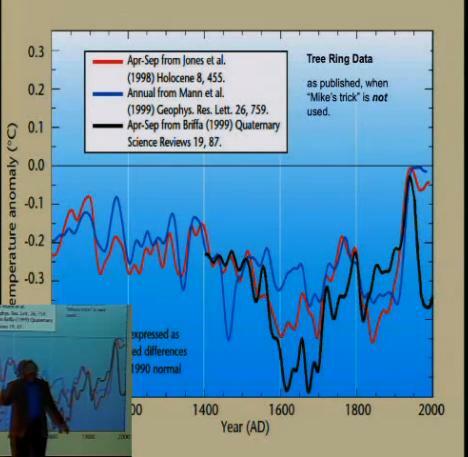 Steve: the impact of hide-the-decline was shown at CLimate AUdit long before Muller’s talk. Muller’s coverage of the issue was timely and appreciated. Not wishing to detract from the work that Jean S and Steve have presented, it is very detailed. Since 2005 or so I’ve been interested in the wider question of whether dendro work has the innate ability to provide for a temperature proxy at all. I know that Craig L has written on this, as have others, but the way I regard it follows from an inspection of the graph that heads this essay. You will see that the graphs ‘shafts’ vary between -0.1 and -0.6 deg C. with individual graphs showing textural wriggles corresponding to about 0.02 C. That performance is better than thermometers alone can produce in conventional use for temperatures 100 years ago. These graphs show a conversion from a tree ring response to a temperature proxy through a calibration step. The calibration had an input temperature that is not accurate better than (arguably) +/- 0.5 C. Even if temperatures applicable to the sites could be measured to +/- 0.1 C (doubtful) the resulting hockey sticks still have texture at a fifth of that level. In other words, the attribution of texture is false because it has character more fine than the data input to it. As well as challenging the truth of the texture, I also challenge the ability to place the whole of each of the graphs accurately in the Y-axis setting. That is, I would claim that there is a potential for bias that could disallow the congruence shown, of the tree record with the temperature record. The whole of each tree graph could properly move up or down a few tenths of a degree from uncertainty. It seems merely artistic to make it a smooth union and not a gap. Although the alleged dishonesty here is from hiding the decline, I allege more fundamentally that the basic use of dendro as a temperature proxy is invalid and that this should have been known to the researchers reporting it. You cannot make a silk purse from a sow’s ear by believing that wriggles produced by a computer treatment of data are of necessity connected to any physical, natural effect. How many readers have ever seen the formative studies for dendrothermometry, where actual tree data are compared with temperature data along with proper estimates of bias and precision? I can’t recall any that pass, but my reading is not comprehensive. I must confess a grudging admiration for Jones and Mann. Where most mortals (those with scruples and capable of shame) would have acknowledged error for the sake of “the science,” these two boldly double down. I can’t tell if they’re maniacally opportunistic or simply bad scientists, or both. Has a comparison chart been done of what the end of MBH looks like without Mike’s Nature Trick? Considering that previous court review had sided with Dr. Mann, taking their previous argument(s) with reflexive acceptance, might such an ‘extremely rare’ move backfire? The reason such language is rare is because seldom engage in the type of conduct Mann’s lawyers have engaged in and opposing won’t make that type of accusation unless they are certain it is warranted. I don’t think it will backfire. JD Ohio has observed here and elsewhere that Mann’s lawyers have been pushing ethical boundaries. Cei is calling them out. It is surprising, to say the least, that Mann now claims the “misleading” figure published on the cover of a WMO report “had absolutely nothing to do with [him],” Mann Br. 13, in light of the facts that he is listed as a co-author of the figure and actually claims co-authorship of it in his curriculum vitae. Jean: I’ll bet the attorneys are grateful that you are “always happy to help,” to quote you in another context. Seriously, it would be interesting to find out how many billable hours are being spent reading ClimateAudit. Generally, I thought that CEI’s brief was excellent, but have a lower opinion of NR’s brief. Thus, I believe that CEI’s brief is very good. It directly and simply addresses the factual point that, in no sense of the word, did any true investigation exonerate Mann. It also simply and clearly points out Mann’s hypocrisy. This gives Mann the opportunity to argue that he was “exonerated” in some meaningful way, whick I don’t agree with. To summarize, I am happy that CEI hit the exoneration issue in a straightforward and simple manner. This is a major reason that I have been posting here. Have been hoping that law firms would read blog posts (I believe CEI lawyers did) and that that would improve the accuracy and effectiveness of the briefs and save the defendants money. I thought NR’s legal arguments were intellectually interesting. Whether they will be effective depends on the makeup and predilictions of the DC Court of Appeals. I was also disappointed by the National Review brief, which also incorrectly described some of the factual matters. I agree with your conclusion that CEI counsel have been reading here, but it doesn’t look like NR counsel have. A question for pauldd, Joseph W., and/or JD Ohio … Suppose NR and CEI succeed in their appeal and Mann’s lawsuit against these two defendants is thrown out. If that happens, what options for subsequent legal moves should Mark Steyn and his lawyers be considering? If Steyn is totally off the hook, if I was him (with his intense dislike of legal proceedings), I would take my marbles and go home. As I have said before, I am not impressed with Steyn’s countersuit. JDO and Pauldd, it seems to me that the paragraph highlighted by Paulldd offers an alternative route to what Steyn’s countersuit was seeking i.e. a finding that they should be “sanctioned for misrepresentation of the record and for unreasonably imposing litigation costs on Defendants.” See quote in pauldd’s comment. The citation, Bredehoft v. Alexander, 686 A.2d 586, 589 (D.C. 1996) is a case where side was seeking damages for supposed failure of opposing counsel to do “reasonable” investigation into the cause of action of their client (though the defendant was found to have done enough investigation. It is hard to see how any “reasonable” investigation of “exonerations” where Mann is not even mentioned could have concluded that they had investigated or exonerated Mann himself. So if counsel has a duty to the court to do some investigation of matters pleaded (and I don’t know whether US counsel have such a responsibility), then I can definitely see a cause of action against Mann’s counsel – one which CEI seems to be setting up. I agree that it does give Steyn some opportunity to recover for the misstatements made in Mann’s pleadings and briefs. However, before he could get compensated, a substantial amount of additional litigation would probably be required. Also, courts are generally reluctant to impose sanctions and you never know what they will do. If someone less legal averse than Steyn were involved, I might suggest that a motion seeking compensation for sanctions be filed. Also, there is the issue of whether there are any legal grounds for Steyn’s countersuit. If Steyn formally files for sanctions, Mann will almost certainly seek sanctions for the filing of the countersuit, assuming that there are substantial holes in his legal theories, which I expect that there are. JD: Shades of Jarvis vs Jarvis? Steve: Yes.Started. I don’t know how to transfer comments en bloc but will copy this one. Readers, please continue comments on this topic at new thread. If this “money quote” succeeds, will it not provide ammo for Steyn in his countersuit? That is to say Mann is shown to put forth in his brief that which he knew was not true. I think you pose a very interesting question that would take more time to fully analyze than I have time for now. 1. If the CAP reverses the trial court (a possibility that I view as increasingly likely) and 2) If the cout of appeals sanctions Mann’s attorneys (a much bigger question mark), then I think that Steyn would have a good chance of obtaining sanctions under the civil rules that could include an award of his attorney fees. I have been very skeptical about the likelihood of Steyn prevailing on his countersuit after a cursory review of it because I didn’t think he met the requirements to plead malicious prosecution and I thought his other theories were very novel. I would leave a more definitive answer to an attorney who examined these issues much more carefully. Wow. And they fight, fight, fight to keep their little money machine printing away.